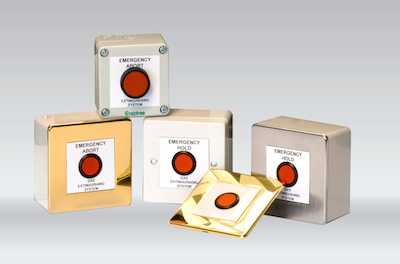 The Hold and Abort Switch Modules complement the ExGo extinguishing and suppression control panels. The modules comply with the requirements of BS7273-1. The switches are easy to wire and multiple units can easily be daisy-chained together on an input circuit. A range of finishes are available - white, stainless steel and brass trims. Alternatively, the unit can be supplied in an IP65 rated enclosure. The standard units can be surface mounted or semi-flush mounted onto standard 3½” electrical boxes. The IP65 unit is surface mounted. All units are provided with an end of line resistor (Reol). Compatible with the ExGo gas extinguishing panel and remote status indicator panel input circuits.